BANGKOK, Thailand -- Women in the Buddhist monastic tradition known as bhikkhuni, or female monks, are gradually reviving the order which has lain dormant for almost a millennium, but their efforts are meeting with scant enthusiasm in Burma, Buddhist practitioners say. “When I did research on becoming a bhikkhuni, I found indications in all of the research that it was possible to recreate bhikkhunis, and I was greatly pleased,” Burmese bhikkhuni Daw Gunasari said in an interview at a U.N. award ceremony in Bangkok in honor of International Women’s Day. 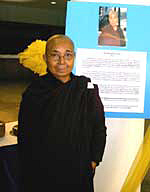 In December 2004, Burmese authorities detained another bhikkhuni, Daw Thissawaddy, on her return to the country after she wrote to the top Buddhist authority, the Sangha Nayaka Council, asking for the practice of female monks—known as bhikkhuni and accepted in Sri Lankan traditions of Theravada Buddhism—to be reinstated in Burma, citing historical precedent. “It’s really sad if you look at these things. What we are doing now is not to destroy the teachings of Buddha. You can find them if you search history. And so, we don’t want to argue much. We don’t want to say anything. History will show that we are doing the right thing,” she said. “Bhikkhuni” was the name given to followers of the Buddha during his lifetime, without regard to the person’s gender. Later traditions evolved into separate monastic traditions for Buddhist monks and nuns, with nuns generally accorded a lower status and barred from leading others in religious activities. Daw Thissawaddy, 40, had been studying for a Ph.D in religious philosophy in Sri Lanka and been ordained there as a bhikkhuni, a fellow nun told RFA’s Burmese service. She was detained after returning to the Burmese capital, Rangoon, in December 2004 to attend the World Buddhist Summit, attended by Buddhists from all over the world. A Burmese abbot living and practicing religion in Thailand said the practice of female ordination as monks shouldn’t be allowed. “It’s because the order was destroyed. I’m looking at it according to the rules of conduct. It’s not my opinion. It’s the Buddha’s opinion,” the abbot said. Daw Gunasari said many in Burma were uninterested in the revival of female monks due to lack of awareness of the issue, rather than informed judgment. “However, we can only explain to those within our reach from here, from this country, from a Western country, as much as we can. We don’t feel anything against them. I just believe that this is happening only because they don’t know about this,” she said. Original reporting in Burmese by Tin Aung Khine and Khin Maung Nyane. Written for the Web in English by Luisetta Mudie and edited by Sarah Jackson-Han.